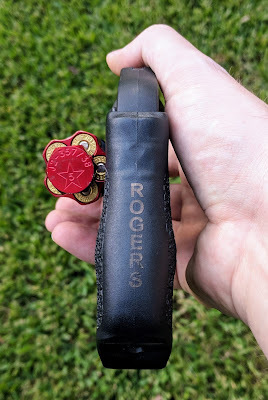 Over the course of the last weekend of September, I attended the Pat Rodgers Memorial Revolver Round Up hosted by Hardwired Tactical Shooting in Carrollton, Texas. The 2018 course focused on snub nosed revolvers. In anticipation of the event, I reached out to several companies for products designed with the Ruger LCR in mind. 5 Star Firearms responded to my request immediately and graciously sent a care package with several LCR accessories my way. 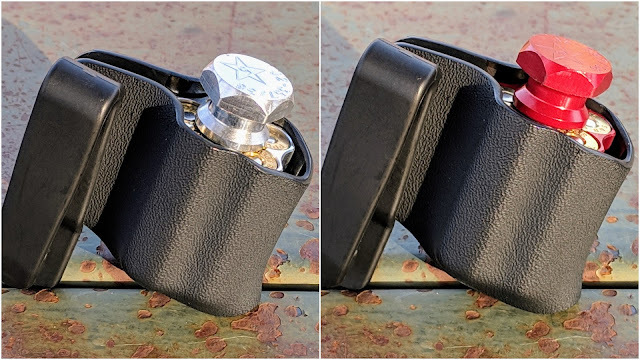 Here are some of my thoughts regarding the speed loaders, kydex speed loader carrier, and two different loading blocks. 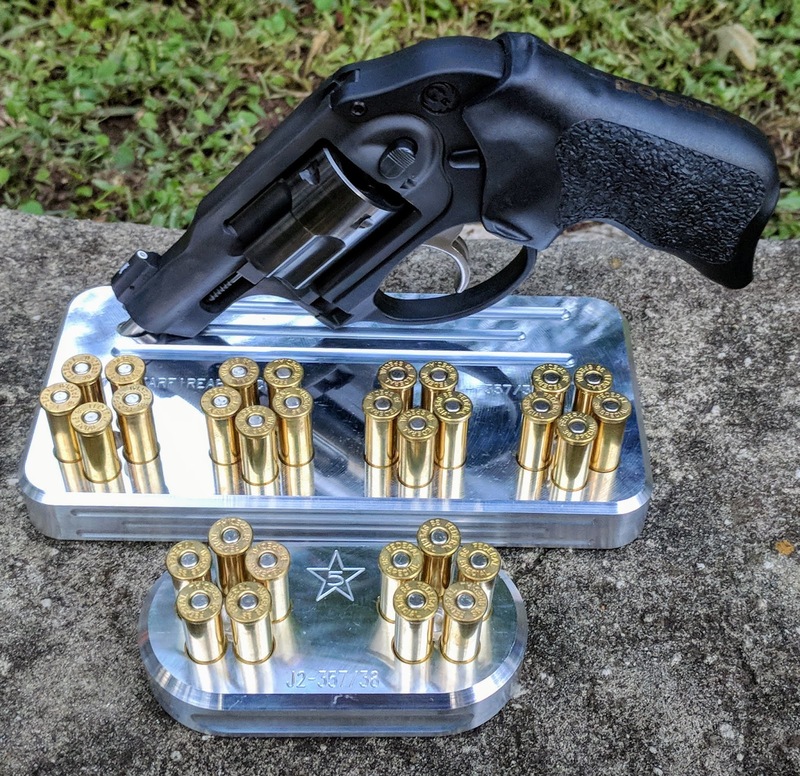 Prior to receiving the 5 Star speed loaders, most of my LCR reloads were conducted with HKS Model 36 speed loaders. HKS loaders feature a plastic body and knurled handle that releases the rounds with a clockwise turn. I have encountered two issues using HKS loaders. First, the plastic body of the HKS contacts the stocks and does not allow the loader to completely line up with the cylinder. It often requires a little wiggling for the rounds to fall into place. Second, as a lefty, turning the knob clockwise often resulted in the speed loader rolling towards the gun and cluttering up the reload process. In my opinion, 5 Star has addressed both of these issues. No contact with the grip. 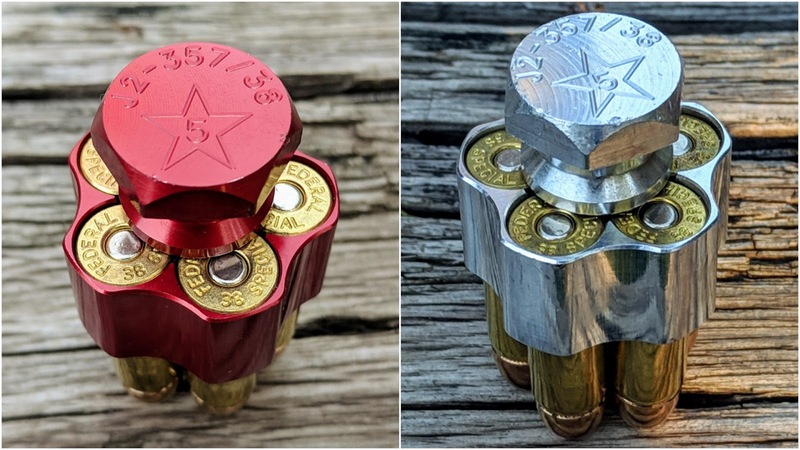 5 Star Firearms speed loaders are made entirely of aluminum rather than plastic. Model J2-357/38 are designed to fit the slightly smaller Ruger LCR cylinder. As you can see in the picture above, the loader body does not contact my preferred grips during the loading process. Additionally, these loaders feature a counter clockwise turn to release the rounds. As a lefty, activating the knob also send the loaders to the left and away from the revolver. I think both of these features are huge improvements to the turn release speed loader design! While I used other loading devices during each block of instruction, the 5 Star speed loaders quickly became my most frequently used device. Range work at the 2018 Revolver Round Up was conducted on a concrete bay rather than dirt or fluffy grass. How did the 5 Star Firearms speed loaders hold up to two days of repeated drops onto hard surface? Pretty well. As you can see in the photos above, The concrete left some dings on the aluminium loaders. Despite this abuse, all four devices continue to function flawlessly. I was a little bummed the concrete marred the red anodizing, but now the loaders have character and I know they can stand up to hard use! 5 Star Firearms also offers the Kydex Speed Loader Carrier for the J2-357/38. I was most excited about this product as finding speed loaders for certain models can be challenging, but finding kydex carriers can be next impossible! 5 Star must have recognized this and manufactured a carrier for what I would guess is their most popular device. The clip is low profile and reversible to make inside the waistband carry comfortable...especially at the center-line position. I really like this carrier and this has been riding around on my belt since the course. 5 Star Firearms also included a Range Stand and a Bedside Block to make reloading between strings of fire much faster. Simply load the bases with rounds, load the speed loaders, and then top off the bases with additional rounds for future use. Both bases are precisely milled to fit the footprint of the speed loader, so the speed loaders fit over the rounds perfectly. The Range Stand is designed to hold both your revolver, prepared loaders, and extra rounds. The base is wide and heavy enough to hold the wheel gun at the ready between strings of fire. At the time of this post, the Range Stand is only available in the natural finish, but that finish sure is shiny! The theory behind the bedside block is simple; the block is a great way to have spare ammunition loaded and accessible on your nightstand, should you need it. The bedside block can also be anodized in the same finishes as the speed loaders. 5 Star Firearms produces some fantastic accessories, particularly for the Ruger LCR. The speed loaders performed well in a semi-stressful environment and after taking a bit of abuse. I plan to continue carrying a red 5 Star J2 in their kydex speed loader carrier. The option to color the aluminum loaders is really neat. If you are like me and would like to color code your gear for different firearms, the anodizing option might be exactly what you are looking for! Special thanks to Kim at 5 Star Firearms for sending me all of this gear to test at the 2018 Pat Rogers Revolver Round Up. The company also manufactures loaders and accessories for six, seven, and even eight shot revolver so if you are need of a quality turn release loader, please visit their website! I didn't know that they sold a kydex speed loader carrier. I'll have to get one. Normally mine just rides around in the 5th pocket of my jeans, but I'd like to get a purpose-built solution. Great option for their five shot models. HKS used to ride around in the pocket until I discovered these.